Why use a tailor for your next corporate suit? The corporate arena is rife with competition – whether you’re interviewing for a new job, working hard to impress your superiors, or rather looking to set a good example for your employees – you need a suit that says you’re a strong, capable and switched-on businessman. The reality is, an off-the-rack suit doesn’t say any of this. So, how is a made-to-measure suit different? The nature of mass manufacturing means that most clothing is designed to cover a range of sizes in an acceptable manner. Therefore, when you buy an off-the-rack suit, you’re choosing the size that’s your closest fit, with the likely intention of getting it altered. The issue here is that even after heavy alterations, it never looks made for you. Often superficial changes can improve the ready-made appearance, but doesn’t disguise its true shape and style. On the other hand, a made-to-measure suit is created specifically to fit and flatter your body shape, and the way you move. The style of a suit says a lot about its wearer. It conveys personality, taste and character. This being said, you need to consider how you want to be perceived before donning any old one at work. With a made-to-measure suit, you receive a totally unique garment that’s been created to compliment your individual style, as well as your career goals. You benefit from the expertise of a professional tailoring team that helps you choose from a huge range of premium fabrics in several colours, patterns, weights and compositions. In stark contrast, off-the-rack suits come with very limited stylistic options. It can also be quite a futile, time-consuming exercise going from store to store in search of the suit you’re after, only to end up settling for one that’s not quite right. A quality made-to-measure suit will last a very long time, whereas an off-the-rack suit has a relatively short lifespan. While a made-to-measure suit moulds to your body more and more over time, a pre-made suit has adverse reactions to cleaning and pressing agents and ultimately loses its shape. A made-to-measure suit is an investment that pays off quickly, especially when it’s a suit you can wear regularly. While lower-end off-the-rack options are typically cheaper to buy in the first instance, most of us find the need to replace them often. This happens just a few times and you’ve already exceeded the cost of your made-to-measure suit, designed to last much longer. Alternatively, if you’re considering a mid-range off-the-rack option, you may be surprised to learn that a made-to-measure suit is comparable price-wise. It makes sense then to go for the unique, tailored option over the one that’s mass-produced. Customer service is the backbone of any reputable tailoring business. At Oscar Hunt, we welcome you into an atmospheric showroom with a couple of house-made beverages. 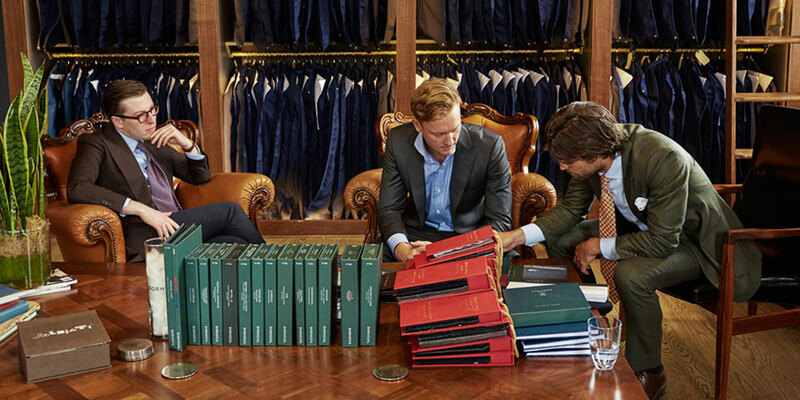 From there, our expert team guides you through a truly memorable, enjoyable process that covers everything – head to toe – and results in a suit made precisely for you. Are you ready to experience the made-to-measure difference? Contact us to organise an obligation-free consultation for your next corporate suit.